Mainstream media quick to pounce with presumptuous reports. By Darren Boon. 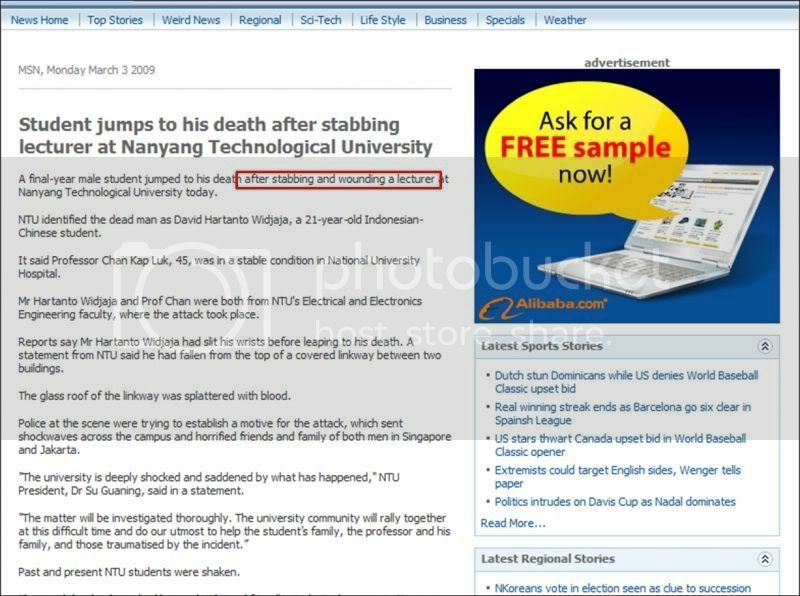 When news of a stabbing incident on the Nanyang Technological University campus broke on Monday morning, the mainstream media descended like a pack of wolves onto the story. However, the likes of OMY, Today, Channel News Asia, Asia One, and to a certain extent The Straits Times, had misrepresented information in their stories. 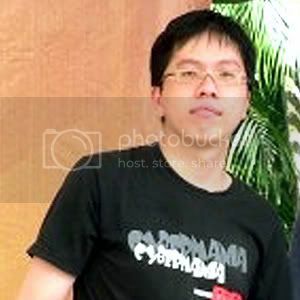 The Online Citizen had received an email from Mr Edwin Lesmana Tjiong who is a friend of the deceased (David Hartonto Widjaja), alleging an inaccuracy in the media reports. Together with some other Indonesian students, Mr Tjiong was at the International Student Center on the night of the incident and had spoken to the deceased’s parents. Mr Tjiong reports that the parents had seen the body and stated that there were no wounds on the deceased’s wrists, a fact confirmed by the police. “I assumed that his parent would not lie. It means that all media news about ‘David slashed his wrist’ were fake,” Mr Tjiong said. 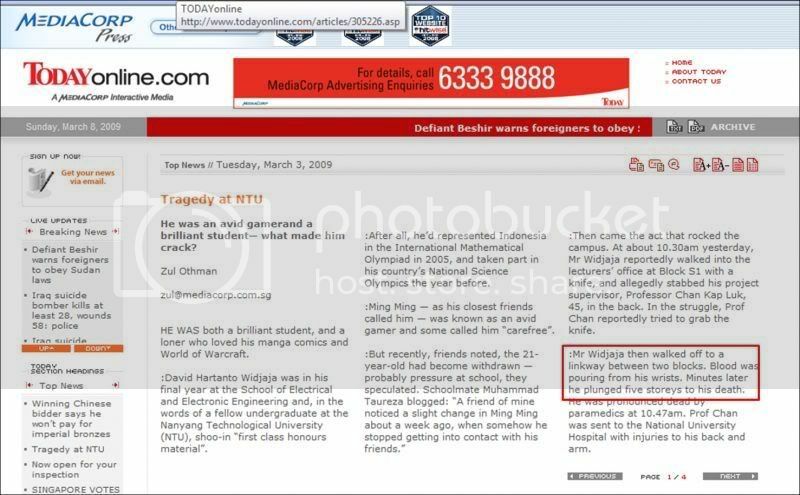 Mr Tjiong also reports a slash wound which was found on the deceased’s neck. The Online Citizen has clarified with Mr William Hartonto Widjaja, older brother of the deceased, about what Mr Tjiong said. “The police who investigating David’s case, himself, is the one who reported it to me. We asked whether there is a wound found on David’s wrists because media reported that David slit his wrists. The policeman said that there is no wound found on David’s wrists and he asked me not to trust the media,” Mr Widjaja said. Mr Widjaja also attests to the above points reported by Mr Tjiong to The Online Citizen to be true. We would like to highlight some of the more speculative reports by the mainstream media which seem to be based on nothing more than the reporters’ assumptions. This was one of the earliest reports regarding the incident. As you can see, the highlighted parts were reported as though they were facts or factual. As the police is still investigating the case, one is left wondering why Channel Newsasia allowed such a report to be published. 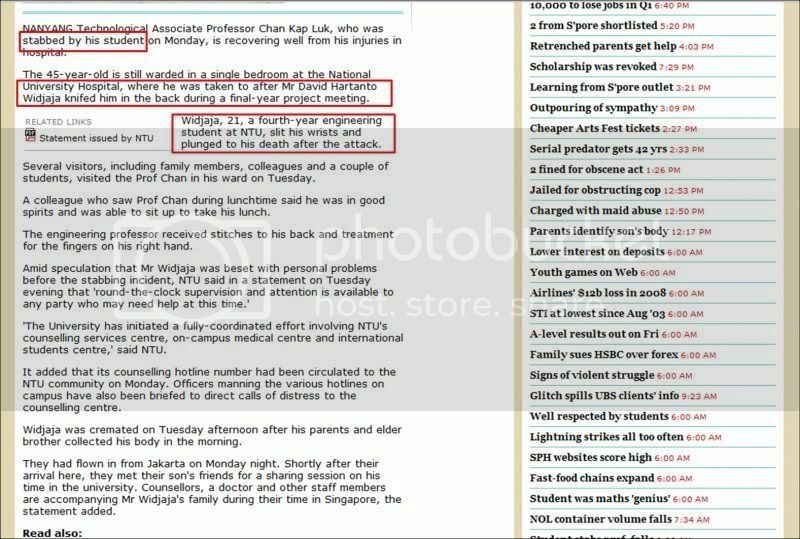 The official press release from NTU said that Widjaja had fallen off the building. 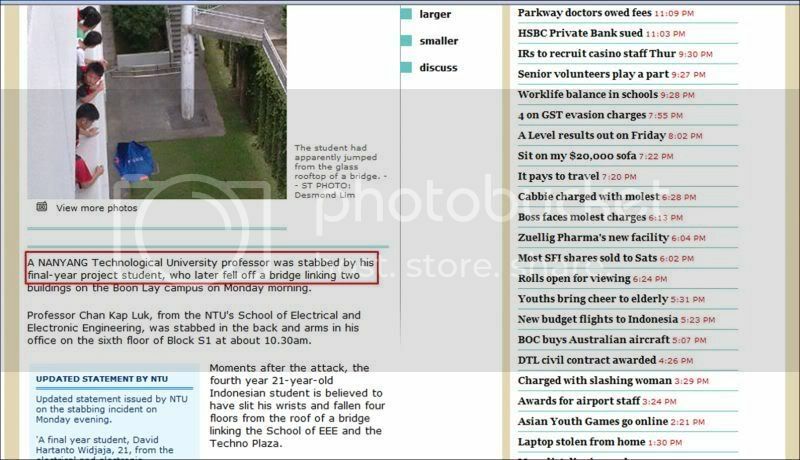 Why did Channelnewsasia state that Widjaja jumped off the building? They had also stated that Widjaja had slit his wrist which is now proven erroneous from the account by David Widjaja’s parents and brother. Omy made the same mistake as CNA as to state that the deceased had slit his wrists before he fell. Omy’s suggestion that the deceased had attempted a dual suicide bid is pure speculation and can be distressing to both friends and family of the deceased. The Straits Times had been slightly cautious in its reporting, but they still could not resist mentioning the part of the slit wrists. Asia One here states as though it is concluded fact that Widjaja had stabbed the professor. 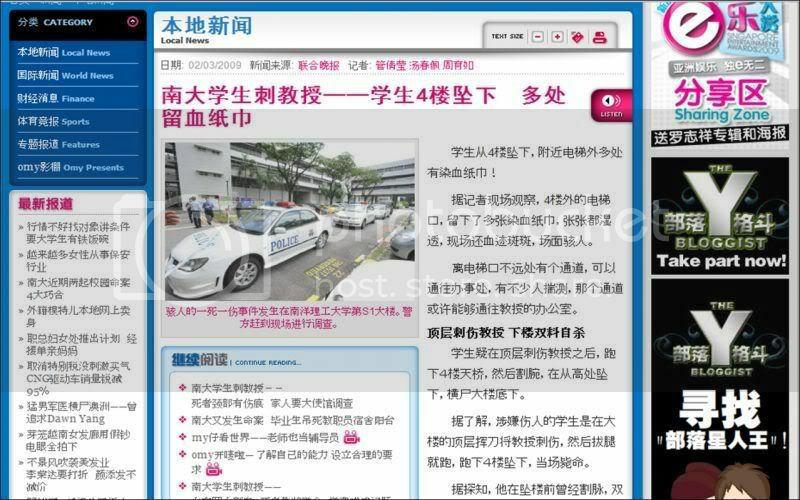 The report then attributed a “Chinese daily” for the report of the stabbing, resulting in one assumption being perpetrated further. Some mind-boggling questions. How did the don’s colleagues know what had happened when they were not even in the room? How were they able to relate the incident vividly? Who were the colleagues that were interviewed? The source was not stated. Who did the reporter know who said that the deceased slit his wrists before running out of the office? Was this the exact chain of events or just pure speculation on the reporter’s part? 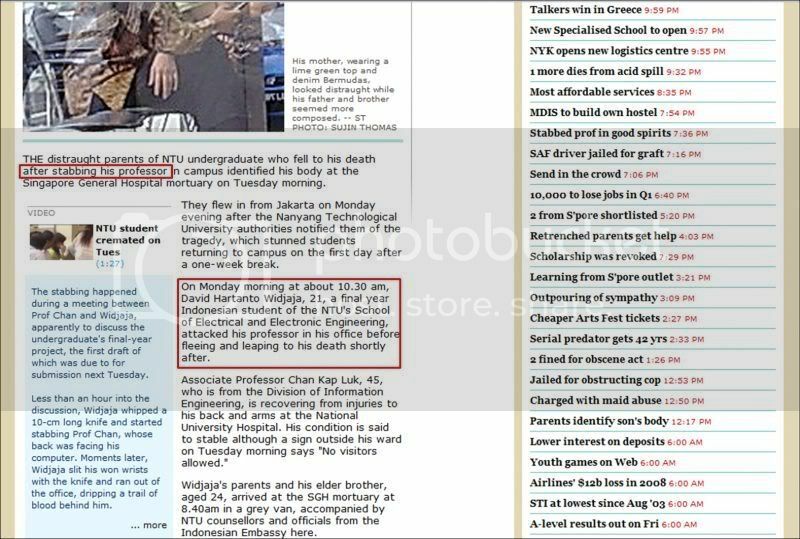 Note that in the statement issued by NTU, there was no mentioned about the slit wrists, yet in this report by Teh Joo Lin, Teh mentions that Widjaja had slit his wrists before falling to his death. While the official statement states that Widjaja had fallen to his death, the report here is a little presumptuous in stating the deceased ‘leaping to his death’ when it may not have been the case. It sounds as though the deceased purposefully caused his own demise. Drawing on other news reports, MSN (Microsoft Network) also reports the deceased had slit his wrists before leaping to his death. It is still unclear if the deceased had leapt to his death. It is clear that he had fallen. So why did MSN state he leapt to his death? While Today attributed the source of the information to a contractor who wishes to known as Mr Tuen, the rest of the media did not quote their source or sources. But if this is so, wouldn’t what Mr Tuen saw contradict what the deceased’s parents had said, that there were no wounds on David’s wrists? 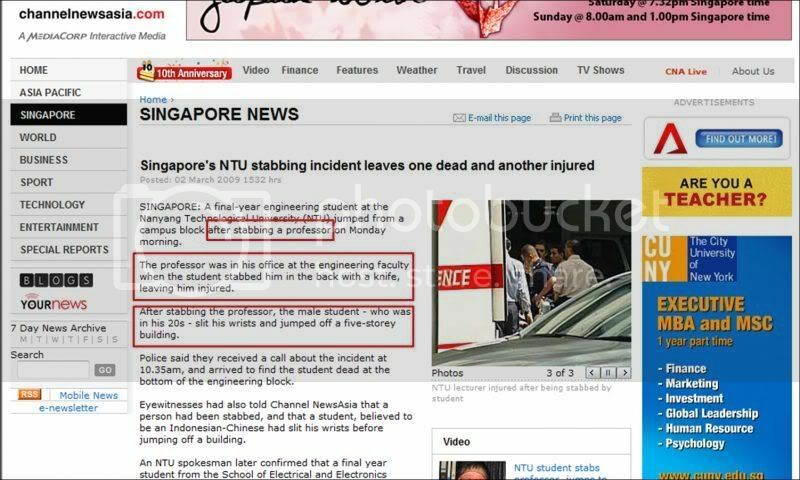 A Facebook group has been set up calling for the truth behind the NTU stabbing incident.